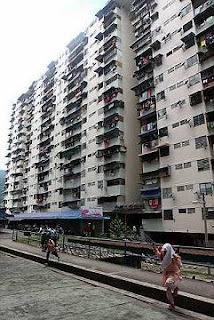 The Penang Government is offering to bear 80% of the cost of repainting the exterior of state-owned high-rise flats with residents footing the balance money. Chief Minister Lim Guan Eng said the state government made the decision after receiving requests from residents that their flats were in dire need of a fresh coat of paint. “The state will bear a substantial amount of money for the repainting work. “I hope flat residents and their Community Development and Security Committee (JKKK) will meet to discuss the offer and get back to the state quickly, hopefully by end of the year,” he said during a visit to Kampung Melayu flats in Air Itam on Thursday. Lim said the repainting of the two blocks of Kampung Melayu would cost RM600,000. There are a total of 966 units there. He added that even though repainting work was not as urgent as upgrading of basic infrastructure, the state was willing to bear the cost. “In 2009, the state began allocating at least RM10mil a year for the upgrading of facilities at the 15,000 state-owned units but the budget did not include repainting work. “Before the new state government took over, there was no such allocation,” he said. For Kampung Melayu, Lim said the state spent about RM467,500 last year to undertake 13 upgrading works like rewiring of electricity cable in the units and corridors, replacing cast iron pipes, replacing rain pipes and re-attaching waste nozzle cap. “Since we have done all these, we hope residents will pay up the more than RM150,000 maintenance arrears and about RM3,000 rental arrears,” he said. State Town and Country Planning, Housing and Arts Committee chairman Wong Hon Wai said there were 45 state-owned housing projects including terrace houses. Wong, who is also Air Itam assemblyman, said the upgrading work at the Kampung Melayu flats undertaken this year included resurfacing of road and car park area, rewiring of electricity cable at Block A and replacing three lifts at the same block. Meanwhile, Lim announced that the state government would repair the roof of a low-cost flat which was damaged by strong winds in Taman Bukit Minyak, Bukit Mertajam several days ago. He said the state would fork out more than RM200,000 for the purpose. “Those affected will be provided temporary housing till repair works are completed. “The Penang Water Supply Corporation will also repair the water tank in the flat which was damaged during the storm,” he said. Way to go! This is good governance! Hopefully we can have well-maintained buildings like the HDBs in Singapore.